Six mango hybrids, namely, Pusa Arunima, Pusa Surya, Pusa Pratibha, Pusa Shreshth, Pusa Peetamber and Pusa Lalima were released and notified by the NCT Govt. of Delhi. Whole transcriptome analysis on mango variety Dushehari and Neelum achieved and DNA fingerprinting of ber, mango, citrus and grape was accomplished using different molecular markers. A technology related to HDP in Allahabad Safeda guava has been demonstrated. The efficacy of Pusa Srijan as a dwarfing rootstock for Allahabad Safeda guava demonstrated. Selection criteria for screening citrus against salinity have been developed. 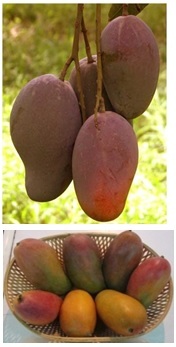 ‘Kurukkan’ and ‘Olour’ were identified as a salt tolerant rootstock for mango. Sour orange, and RLC-6 Attani were identified as salt tolerant rootstock for citrus. Technique of pruning for restoration of yield in unproductive 'Amrapali' orchards has been standardized. 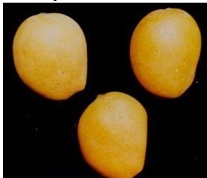 Developed technology to mitigate NaCl stress in citrus through paclobutrazol. Protocol for in vitro multiplication of grape genotypes and bio-hardening using AMF was developed. Protected cultivation of papaya standardized. Pollarding in papaya suggested for obtaining two ratoon crops. Pusa Surya is a regular bearer variety. Its plants are semi-vigorous. Therefore, it is suitable for closer planting (6 m x 6 m). It is less susceptible to mango malformation in comparison to Amrapali and other commercial cultivars of northern India. It ripens by 3rd week of July. The fruit is medium to large in size (270 g) with attractive apricot yellow peel colour and medium total soluble solids (18.5%). It is rich in vitamin C (42.6 mg/100 g pulp ) and Beta carotene content. It has good shelf life (8-10 days) at room temperature after ripening. It is suitable for domestic and international markets. It was released in 2002. Pusa Round:It is a promising selection having dense foliage and attractive round fruit. It has uniform bigger sized fruits (268.68 g), high juice (119.00 ml/fruit; 48.26%) and high TSS (10.140B) content with moderate acidity (0.92%). Furthermore, the plants are moderately vigorous and about 400 plants of this selection may be accommodated in a hectare (5 m x 5 m). On per plant basis, it yields about 3.5-fold higher than Jaffa and 2.4-fold higher than Valencia. Therefore, it will give higher productivity per unit area. Its fruits are free from granulation. Pusa Sharad: It is a selection having medium vigorous trees, leaves unifoliolate, petiole wing absent, more or less plane, thorn present, dense canopy, suitable for planting at a distance of 5 m x 5 m. Average fruit weight 227.56 g, round in shape, juice recovery 50.12%, medium thick peel, higher TSS (9.20 ºBrix) and moderate acidity (0.77%).It yields 2.6-fold higher than Jaffa and 1.8-fold higher than Valencia. Therefore, it will give higher productivity per unit area. Its fruits are free from granulation. 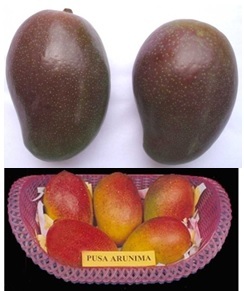 Pusa Abhinav: It is a promising clonal selection having medium vigorous trees, dense foliage, and attractive bright yellow round shaped fruits. It has round the year fruiting with peak harvesting during summer months (March-April and August-September) and is moderately susceptible to citrus canker. It has medium sized fruit (38.15 g) with higher juice content (56.92%) and acidity (7.72%). Round the year fruiting with two season harvesting will make this selection highly suitable for commercial cultivation as well in kitchen garden. Pusa Udit: It is a clonal selection has dense canopy, heavy yielder, fruits round in shape, medium in size (37.9 g), fruit length (43.9 mm), diameter (39.3 mm), peel thickness (1.1 mm), seeds (8.3/fruit), fruits bright yellow at ripening, juice content (43.3%), TSS (8.5%), acidity (6.9%). It produces round the year crop with peak harvesting from August-September and February-March. It is moderately susceptible to citrus canker. Round the year fruiting with two season harvesting will make this selection highly suitable for commercial cultivation as well in kitchen garden. Beauty Seedless: It was introduced by this Division from California, USA and was evaluated and recommended for commercial cultivation in north India in 1972. The berries ripen by the end of May. The vine is medium in vigour; bunches medium to large, long shouldered and compact with bluish-black coloured, spherical, medium sized berries. It is a prolific bearer but the keeping quality is very low. Pusa Navrang: This hybrid is a cross between Madeleine Angevine and Rubired and was released 1996. It is an early ripening (1st week of June), basal bearer and teinturier variety containing red pigment both in peel and pulp.The bunch is loose, medium in size with round and medium sized berries with TSS ranging from 18-20%. It is ideally suited for coloured juice and wine making and is resistant to anthracnose disease. Pusa Urvashi: This hybrid (Hur x Beauty Seedless) was released in 1996. It is early ripening (1st week of June) and a basal bearer. Its bunch is loose and medium in size with seedless greenish-yellow berries.The berry TSS varies from 20 to 22%. It is suitable for table purpose and raisin making. Pusa Aditi: It is a hybrid between ‘Banqui Abyad’ x ‘Perlette’.It is early maturing (1st week of June), seedless having large round berry (2.7 g), yellowish-green in colour, firm pulp with good TSS (19.3°Brix). Vine is moderately vigorous, and is a spur pruned variety. It is tolerant to anthracnose and powdery mildew. Grape bunches and berries are GA3 responsive.The fruits are good for table purpose and making juice. The average yield is about 12-15 t/ha. Pusa Trishar: It is a three way cross hybrid between (‘Hur’ x ‘Bharat Early’) x ‘Beauty Seedless’. It is early maturing, suitable for sub-tropical conditions, semi-vigorous and spur-pruned, having moderate tolerance to anthracnose, powdery mildew and termite. It matures by 10th June. Berries are round (2.15 g), yellowish-green in colour, with good TSS (18.4°Brix) and firm pulp. Grape bunches and berries are GA3 responsive. The fruits are good for table use and juice making purpose. The average yield is about 14-16 t/ha. Pusa Swarnika: It is a hybrid between Hur x Cardinal. It matures early with large berry which are round golden-yellow colour with firm pulp. Berries are very sweet having high TSS (20+ °Brix).It has natural loose bunches with natural bold berries (15+ mm dia.). The clusters are medium big in size. Average bunch size is 409 g and bunch length 20 cm. The fruits are ready for harvest between 75-80 days after full bloom being early maturing variety. Normally fruit yields from the mature vineyard of 6-8 yr old may be obtained 6-8 tons per hectare on head system.The hybrid is tolerant to anthracnose and powdery mildew. The hybrid has good traits for table purpose, juice making and Munnakka preparation. Pusa Srijan: A complete set of trisomics was identified in the progeny of triploid guava for the first time in fruit crops. It has helped in the development of trisomics and tetrasomics in guava. Out of many promising aneuploids, Aneuploid No.82 was found the best in imparting dwarfness in commercial cv. Allahabad Safeda and released as Pusa Srijan in 2004. It is a potentially dwarf rootstock for guava and has been recommended for Allahabad Safeda variety for establishing high density orchard. Establishing high-density orchard in Kinnow mandarin. 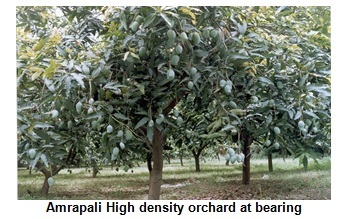 Establishing high-density orchard in Amrapali mango. Technology to improve productivity of old mango trees. Technology for improving fruit quality in grapes under North India. Mango is generally being cultivated at wider spacing (10-15 m) wherein only 80-100 trees could be planted in a hectare of area. Under this system lot of available area/land could not be utilized efficiently which causes a loss of revenue from the available land are results in low productivity. High density orchard is accommodated more than 375- 450 and more trees per hectare. High density plantations are the consequences of continuous decline in the availability of cultivated land, rising energy and land cost together with the mounting demand for horticultural produce. Besides an increased number of trees/ha, a high density orchard must come into bearing within 2-3 years after planting, through using precocious rootstocks. As tree density increased, profitability increased up to approximately 2500 tress per hectare. The result of medium density plantation is most encouraging in mango. Dwarf and compact trees in high density orchards, not only provide high yield and net economic returns per unit area in the initial years but also facilitate more efficient use of fertilizers, water, plant protection measures, weed control, and easy efficient harvest management practices. Therefore, this technology was developed for ‘Amrapali’ mango, which is a genetically dwarf variety. The trees are recommended to plant with triangular system at closed spacing (2.5 m x 2.5 m) accommodated 1600 trees per hectare. If possible, orchard should be establishing in-situ. In this system rootstocks should be directly planted in the orchard, which later on grafted in the field itself. This save the resources and time to establish an orchard. Plants should be pinched initially for two years from the terminal branched to make tree as a bush. After 3-years plants are ready to give the fruiting. In ‘Amrapali’ bearing is profuse, reduces fruit size. Therefore, to encourage the fruit size thinning is mandatory. Good fruit yield are expected from tree age of 7-8 years. Trees after 12 years attain profuse vegetative growth which in turn reduces fruit yield. Therefore, annual regular pruning is required to keep trees well exposed to sunlight as well ventilation. Nutritional management in the orchard is the essential part to sustain the productivity with higher returns. Therefore, apply annually in each basin of the tree @ 20-25 kg well rotten farm yard manure, 2.17 kg urea, 3.12 kg single super phosphate and 2.10 kg potassium sulphate after 10th years of plant growth. In the initial years i.e., in 1st year apply 20 kg well rotten farm yard manure, 217 g urea, 312 g single super phosphate and 210 potassium sulphate. Farm yard manure and phosphorus should be applied during month of October. Half dose of urea and potassium sulphate is given in October and remaining half jutst after harvesting of fruits (June-July). To supplement the deficiency of zinc and manganese, 2% zinc sulphate along and 1% lime should be applied during March-April, June and September and 0.5% manganese sulphate by foliar spray. Spray of borax @ 250-500 g per tree helps to improve fruit quality. In case of boron deficiency spray with 0.6 % solution of borax three time at 10 days interval during April-May. Irrigation should be properly given at critical stages. Drip irrigation is found highly efficient and improves the yield as well fruit quality. Table 1. Management of insect pest and diseases. Apply 200-300 mesh sulphur (500 g/tree), 2-3 spray of Dinocap (1 ml/litre water) during January-February at 15 days interval. Spray Boudreaux mixture (5:5:50) and copper oxychloride (3 g/litre water) during January to June-July. First two spray at weekly interval and later at 15 days interval. Spray Boudreaux mixture (5:5:50) and copper oxychloride (3 g /litre water) after cutting infested twigs. Use insecticide Elosal (2 g/litre water) or endosulphan (1.5 ml /litre water). Later 1-2 spray with copper oxychloride (3 g/litre water). 2-3 spray at 15 days interval is beneficial. Three spray with caustic soda (6-8 g/1000 litre water) at flowering, flowering and fruit set. Use chloropyriphos (1.5 %) (250 g /tree) in December after plouging near tree. Cover tree trunk with polythene 20-50 cm above ground. Or use monocrotophos (5 ml/10 litre water) and diamethoate (1.0 g /litre water). Remove infested twigs and destroy. Plug the holes in stem with insecticides. Two sprays with monocrotophos (5 ml/10 litre water) and quanalphos (5 ml /10 litre water) at 15 days interval. The comparative advantage of high density over traditional system is given in below table. Table 2. Comparative details of high density over traditional system in terms of estimated investment, net returns etc. Kinnow mandarin is very potential and highly remunerative fruit crop. Vigorous rootstock like Jatti Khatti and Rough lemon are very common for kinnow cultivation under traditional system. However, Troyer Citrange rootstock offers dwarfing statute to kinnow. Therefore, high density orcharding is also possible using Troyer Citrange rootstocks at closure planting (1.8 x 1.8 m) accommodates 3086 trees/ha. Table 3.Recommended doses of manure and fertilizers. Kinnow is shallow rooted crop. Therefore, it requires frequent irrigation particular at critical growth stages. Period of fruit growth and development are very crucial which requires assured irrigation. For good crop irrigation should be applied in summers at 10-12 days interval and in winters at 25030 days. Stop irrigation one month before flowering to assure good crop. Table 4.Management of insect pest and diseases. Spray Monocrotophos (0.25 ml/litre water) or phorate 10 G.
Spray holes made on twigs with dichlorovas (1 ml/litre water) or plug holes with cotton contain insecticide. Spray monocrotophos (2 ml/litre water). Use resistant rootstocks like Cleopatra Mandarin, Rangpur Lime, Trifoliate Orange, and Troyer Citrange. Use insecticide to control aphid. Good drainage system. Use tolerant rootstocks like Citrus volkameriana, Troyer, Sour orange, Trifoliate orange, etc. Spray sulphur dust (1 kg/200 litre water). Or spray Dinocap at 10 days interval. Remove infected twigs. Spray Blitox (0.3 %). Remove infected twigs. Spray copper oxychloride (0.3 %) or Bourdeaux mixture (1%) and streptocyclin (10 mg/litre) water. In recent past, guava becomes a remunerative fruit crop due to nutritional awareness and its use for processing. 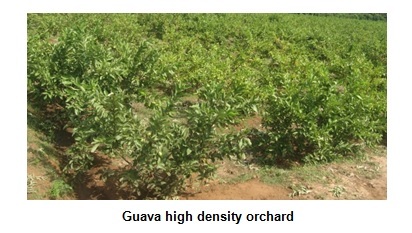 High density orcharding for guava has been developed through use of dwarfing rootstocks, methods planting, in combination with judicious training and pruning. Indian Agricultural Research Institute of Temperate Horticulture has developed a dwarfing rootstock ‘Pusa Srijan’. Grafting of ‘Allahabad Safeda’ on ‘Pusa Srijan’ rootstocks gave a dwarfing statute facilitates closure planting. This reduces about 50% of the tree vigour of ‘Allahabad Safeda’. In the conventional system of planting trees generally plated at wider spacing (6 x 6 m) accommodates 278 trees/ha. Whereas, on Pusa Srijan these can be planted at much closure spacing (3 x 3 m) accommodated more than three time trees (1,111) per hectare. When trees attain the full canopy, needs regular annual pruning to facilitate proper sunlight penetration as well as air ventilation. This is good for getting higher yield per unit area. High density is not possible without application of manures, fertilizers and irrigation at critical stages. Therefore, it should be given priority to supplement the depleted nutrients from the soil through application of required nutrients. The detail of recommended manure and fertilizers are given in the below table. Maintain proper soil drainage. Remove infected parts and burn. Apply Bavistin (15 g) at the basin of each plant after pruning in the month of March, June and September. Apply balance nutrients especially nitrogen should be applied and resistant varieties should be grown. Remove infected plant parts. 4-5 spray of Phytolan (2-3 g 50% /litre water) at 10 days interval. Table 8. The comparative advantage of high density over traditional system is given in below table. 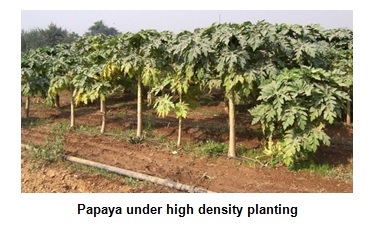 Development of dwarfing varieties in papaya given an opportunity to grow them at very closure spacing. In past, non-availability of such cultivars forced to papaya growers to grow them at wider spacing, which causes a loss of available land for unfruitful purpose. These were generally being planted at wider spacing (2.4 m x 2.4 m) as compared to closure planting (1.25 m x 1.25 m) using dwarf varieties like ‘Pusa Nanha’. This variety was developed by Indian Agricultural Research Institute and catering the needs of growers by supplying true-to-type seeds. Generally, plants starts bearing just 30 cm above from the ground surface and total length of tree reached not more than 1.5 m from ground. Therefore, these are generally recommended to plant at 1.2 m x 1.2 m accommodated 6400 plants per hectare. Another variety ‘Pusa Dwarf’ is also developed by this Institute. This variety is also dwarf in statute and but little vigorous over ‘Pusa Nanha’. This is planted at 1.5 m x 1.5 m spacing accommodates 4444 plants per hectare. Papaya starts early bearing. Therefore, it requires fertile soil and good quality water. Apply 20 kg well rotten farm yard manure before 20 days of planting in the pit. It requires 250 g nitrogen, 300 g phosphorus and 400 g potash. This is give equally in 6-split doses at 2 month interval. For second year crop, 20 kg additional FYM, 1.0 kg bone meal and 1.0 kg neem cake is applied. Irrigation should be given twice in a week in summer from April-June and during winter at 15 days interval. Maintain proper drainage and uproot infected plants. Apply Redomil (2 g/litre water) in near root and stem. Use of Trichoderma is also beneficial to control Pythium and Phytopthora. Treat seed bed before sowing with formaldehyde (2.5 %). Remove and burn the infected plants. Seed treatment with Bavistin. Control white fly with application of Imidachlorpid (3 ml /10 litre water) at 15 days interval. Remove infected plants/ plat parts. Avoid planting of chilli, tomato, tobacco near papaya orchard. Control aphid with spray of 50 EC Malathion (250 ml/250 litre of water). Table 10. The comparative advantage of high density over traditional system is given in below table. Mango malformation is a serious threat to mango cultivation in many sub-tropical areas in the world. 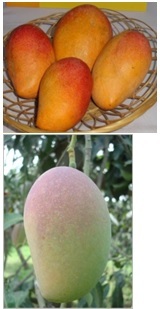 It is now well established that Fusarium mangiferae causes the symptoms of mango malformation. This melody is a serious threat to mango industry. Productivity in malformed mango trees can be improved by a single spray of NAA (200 ppm) in the first week of October followed by deblossoming once at the bud burst stage during January. It has become the most widely accepted control measure for floral malformation. To solve the problem of alternate bearing in mango, the use of paclobutrazol (cultar PPP333) was recommended for the first time in India. Application of paclobutrazol (PP 333) @ 22.5 ml/10 L of water at pea stage of mango fruit was found to induce new shoot growth in 65% of the fruited shoots which accounted for fruiting in the next season. This treatment was found to be the most effective in Langra, which is considered to be a highly alternate bearer. Causes attributed to the problem of fruit drop in mango, like lack of self- pollination, low stigmatic receptivity, and defective perfect flowers, poor pollen formation, presence of self-incompatibility, lack of moisture and incidence of pests and diseases etc. are the some of intensive work carried out in the Division. Application of 2,4-D (10 ppm) holds good for controlling pre-harvest drop in most of the mango cultivars. Pre-harvest fruit drop is a serious problem in different types of citrus. Among the various growth regulators, 2,4-D was found to be the most effective in checking fruit drop. Thus, the recommendations for application of 2,4-D (8, 15, 20 ppm) for Valencia, Mosambi and Jaffa cultivars, respectively during October got accepted commercially. It is a serious physiological disorder of citrus in north India. It is highly pronounced in Mosambi sweet orange followed by mandarins. Studies indicated that the respiration rate in the affected fruits increased by 7-15% while disease and pectin esterase activities decreased, which led to reduction in sugar and increase in polysaccharides. It is recommended that the incidence of granulation can be minimized by the application 2-3 sprays of NAA (300 ppm) and GA (50 ppm) during August to October. Application of 250 mg/l paclobutrazol alone as soil drenching and/or in combination with foliar application of putrescine (50 ppm) could reduce the negative effect of NaCl stress on citrus rootstocks. Pruning intensity has been standardized using bud dissection technique for early maturing grape varieties like 4-6 nodes (Perlette, Beauty Seedless, Cardinal, Delight, Pusa Urvashi, Pusa Navrang, Pusa Aditi), 8 node (Anab-e-Shahi), and 10-14 nodes (Pusa Seedless). Application of Dormex (49% aqueous solution of hydrogen cynamide) @ 1.5% a.i. on dormant buds in the beginning of January or thiourea (4.0-5.0%) immediately after pruning hastened the bud burst by about one month and ripening by 16,12 and 9 days in Pusa Seedless, Beauty Seedless and Perlette, respectively. For improving quality of grape, the application of GA3 has been standardized. Application of GA3 45 ppm at full bloom for Pusa Seedless; GA3 45 ppm at full bloom for Beauty Seedless; 30 ppm at 50% bloom for Perlette are the most accepted recommendations by the north Indian grape growers. Application of GA3 (60 ppm) at 50% bloom and three week later has been found better for Pusa Urvashi, Pusa Aditi and Pusa Trishar. Trunk girdling at 15 cm height on trunk from ground about one month before ripening and followed by spray of 250-400 ppm ethrel at Veraison stage improved the berry quality in Pusa Urvashi. Water berry disorder in Perlette can be minimized by application of 20-30 kg/ha borax in soil or 0.5% sprays of boric acid. To improve berry quality, application of 0.2% ZnSO4, 0.2% boric acid and 0.5% K2SO4 hasbeen suggested. For higher yield, Karna khatta and for dwarfing effect and quality, Cleopatra mandarin were recommend for sweet orange cv. Mosambi under Delhi conditions. Troyer citrange, Karna khatta and Soh Sarkar rootstocks were found as suitable rootstocks for Kinnow under Delhi conditions. These rootstocks staggered the fruit maturity thus reducing market glut. Sour orange, Attani-2, and RLC-6 was reported to be tolerant to NaCl stress. Among these rootstocks Attani-2 and sour orange were found to be Cl- excluder, while Troyer citrange was found to be Na+ excluder at moderate salinity levels. Hence, these could be utilized for commercial cultivation of citrus under mild saline environment. For faster multiplication of IARI released mango varieties Division has standardized soft wood grafting technique for faster and bulk multiplication of plants. 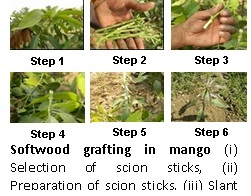 In softwood grafting 45-60 day-old 8-12 cm long, healthy and vigorous scion sticks are suitable for successful grafting. After selection of proper scion stick, leaves are excised leaving petiole attached at the top of the scion. The height of the grafting may depend on the actively growing portion of the rootstock. Sedling. Nine months or above old uniform healthy growing seedlings of small fruited deshi type mango is suitable for softwood grafting. Rootstock is defoliated leaving 3-4 leaves at the base for higher success. Rootstocks should be cut off just above the actively growing point (10-15 cm height). Thereafter a ‘V’ shape slit of 2-4 cm deep is made at the cut end. Scion is trimmed to a wedge shape by cutting off the side of the bottom tip, in order to fit into V slit on the rootstock. After insertion, the graft union is then tightly wrapped around with 100 gauge grafting tape leaving apical portion unwrapped. Do not irrigate nursery beds after grafting until new sprout from scion will appear. After 3-4 weeks when new sprouts from scion appear, grafting tape is removed. Care should be taken to remove all the sprouts arising beneath the graft point for faster growth of the scion. Under north Indian condition softwood grafting can be done from April to August. During summer months if relative humidity is low, place polythene cover over the graft to create the necessary humidity for higher success. After sprouting of scion, irrigate nursery beds regularly. Two to three spraying of insecticide are done as and when required. For proper nourishment, one spray of water soluble NPK (1g/l of water) should be done. In this method plants are ready for sale about 4-5 months after grafting (during July-August). In Epicotyl Grafting 15 to 20-day-old seedlings are used as root stock for grafting. For raising rootstocks mango stones of any variety preferable bigger size are dibbled vertically for convenience during uprooting and transplanting in the raised bed at a spacing of 3 inch x 3 inch. When the mango seedlings are 15 to 20 days old, (still in reddish, bronzy, coppery or greenish red colour and having stone kernel left with some food and nutrient supplement for getting quick joint in the grafts) these are uprooted carefully with stone and root undamaged. The roots and stones are dipped in 0.1 percent Bavistin solution for five minutes after washing the soil. These are cut at a height of 5-6 inch and split longitudinally to accommodate the mother scion (the twigs of desired verity). Mother scions of about 8 inch as collected from the desired mother plant are then given two slanting cut opposite to each other at the base to give a wedge shape. The mother scion used for this purpose should be defoliated 7-10 days prior to the grafting (scion twigs still attached to mother plant) so as to get a plumpy/swelled terminal bud. These cut scions are then inserted in the splitted rootstock carefully and tied by the grafting polythene tape keeping about 6 inch of scion part above the joint. To maintain the smoothness at the joints (mismatch due to the difference in the diameter of stock and scion) and greater success of grafts, one side of the joints is smoothened by matching the stock and scion surface before tying the tape. These stock-scion grafts are then transplanted into the black polybags of size 7 x 9 sq inch and filled by the soil mixture (prepared earlier as in case of normal nursery) firmly. These are then nurtured in controlled condition without exposing to direct sunlight and rain for about one month till the joints are successful. Then these are exposed to open area for vigour growth. Most suitable time for grafting is June 15 to July 15 giving more than 90% success. Plantation in main field is done on the onset of next rainy season when the grafts have attained 3 feet height and of 10-12 months old. Bottom Head Technique: it is a simple technique, devised at the Indian Agricultural Research Institute, New Delhi for facilitating rooting of stem cuttings of difficult to root species. through bottom heat. The device employed consists of a double tin container, the outer one being 70 cm in height and 46 cm in diameter and an inner jacket having a height of 68 cm and a diameter of 44 cm. The space between inner jacket and cutter container is packed with glass wool for heat insulation. Another container which fits into the inner jacket (also constructed from the same material measuring 35 cm in height) and having two electric bulbs of 40 watt each at the bottom end in between the vacant space of the two containers, is fitted. This container is then filled with the rooting media (1 part sand: 1 part grit) and the non-leafy hardwood cuttings are planted in it. The temperature is maintained at about 30 0c through a thermostat which controls the heating bulbs. The cuttings root in about a month and the success is as high as 76 per cent. More than 85.8 per cent rooting can be achieved at 350C basal temperature when combined with wounding and treatment with 5000 ppm IBA. Rooting was the highest when lower concentration of IBA was applied through base the side. Stooling is the easiest and cheapest method of guava propagation. The self-ooted plants (cuttings or layers) are planted 0.5 m apart in the stooling bed. These are allowed to grow for about 3 years. Then these are cut down at the ground level in March. New shoots emerge on the beheaded stumps. A 30 cm wide ring of bark is removed from the base of each shoot rubbing the cambium of the exposed portion in May. All the shoots are mounded with the soil to a height of 30 cm. The soil is covered with mulch to conserve the moisture. After a period of 2 months of the onset monsoon, the shoots are detached from the mother plant at ringed portion and planted in the nursery. The shoots are headed back to maintain the root and shoot balance before planting in the nursery. By following the technique of ringing and mounding of the shoots, second time stooling is done on the same mother stools in first week of September. The rooted stool layers are detached in first week of November. Thus stooling is done twice on the same mother stools in a year. The stooling of a mother stool can be done for many years. With the advancement in its age, the number of stool layers also increases every year. The growth and development of stool layers are better than seedlings. The application of rooting hormone is not required.